1 The plastics pieces on the running boards are lifting up on the ends. Are there replacement pieces for this or can they be fastened down. Epoxy maybe ? 2 The engine hours display in the DIC. What is the use and can it be reset? 1 - One my old GMC truck I ended up putting a self drilling screw (OEM look with the low flat black head) in each towards the ends when they started coming up. I know there are replacement step pads for some but I'm not sure there are any specific for ours. 2 - So that one can determine the amount of wear on the engine. Not terribly common on consumer vehicles but an engine hour meter is very common on commercial vehicles and engines in industrial things like forklifts, boats, etc. Because some vehicles might be run a LOT without actually moving (police cars, ambulances, cabs, etc) it is another way to determine when oil changes might be needed. No, by design, that is just like an odometer and cannot be reset. Complete Nerf Bars sets are available on ebay and amazon, but I've not seen the replacement plastic bits sold seperately. The tubes walls maybe quite hard and thick, it might be better to use regular screws rather than self-tapping screws as they might disintergrate (unless you have tool). 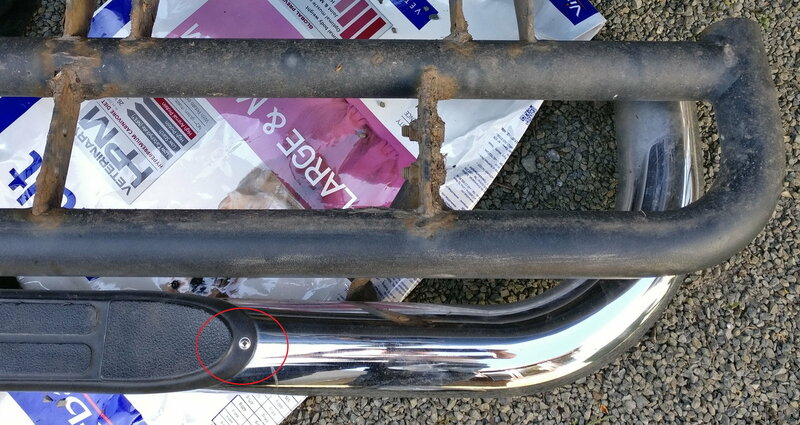 There are various types of nerf bar fitted, some come glued, some screwed, as with mine which are now stainless screws rather than stock mild steel. I recently got all the mild steel parts shot-blasted and powder coated, the stainless tubes had special nut-inserts (Nutserts) which were rusted an siezed solid, these I drilled out and fitted new ones, also replaced all the stock black mild steel fixings ( bolts and washers etc) with A4 Stainless which will never rust! Everything came up like new as you can see! That screw you circled is exactly where I put a screw in the ones on my GMC. My 2005 H2 has 112732 miles 913 hours. The hour meter flips to zero after 9999 hours. 208000k miles and almost 6k hours here .